The genetic variation of a species - its biodiversity - is encoded by the different DNA sequences in all the individuals of that species. This biodiversity has built up during millions of years of naturally arising mutation and natural selection. Biodiversity thus represents the ‘genetic wealth’ of the species, allowing adaptation to new environmental stimuli such as habitat change or disease (Figure 1). A major goal for the future is the harnessing of this wealth for improvement of plant crops by breeding. One of the big problems facing biodiversity research is the measurement of genetic variation across thousands or millions of organisms. We use single nucleotide polymorphisms (SNPs, Refs.1-2, 4, 6), RNA-seq (9) and exome capture sequencing (unpublished) as molecular markers to assess biodiversity of barley and its wild relatives (Figure 2). Figure 2: The genetic diversity of 2-row spring barley cultivars has been subjected to temporal selection over the past century (Reference 7). A) Principal coordinate analysis plot of barley cultivars. The coloured K1 and K2 groups define the major two classes of germplasm diversity defined by STRUCTURE analysis and the grey samples are mixtures of these two. B) Box plot comparing the year of cultivar release, according to the STRUCTURE grouping in A). Boxes represent the interquartile ranges (IQRs) and include data falling between the 25th and the 75th percentiles; flanking lines and asterisks mark data within 1.5 × IQR and 3 × IQR, respectively. PC, principal coordinate. 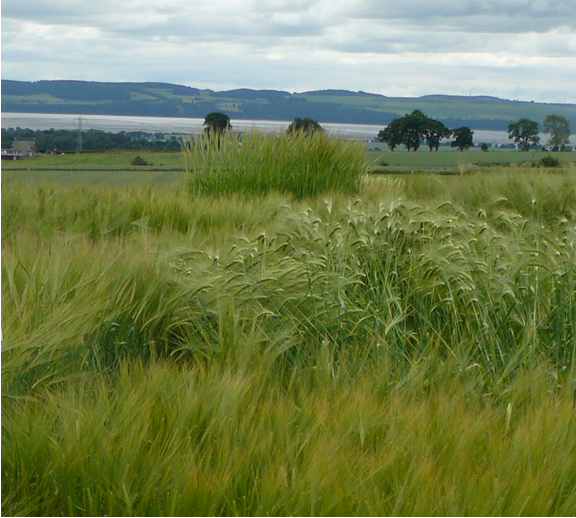 One of our strongest interests is the characterisation of barley genetic diversity. We work with European partners to exploit natural barley diversity for breeding. Our work combines high throughput SNP genotyping of barley germplasm using the Illumina genotyping platform, together with phenotypic analysis (4, 6). Our latest project which commenced in 2014 uses a Nested Association Mapping (NAM) approach that involves ca. 1500 barley hybrid lines containing small defined genome segments derived from 25 highly diverse wild barley lines. The lines are analysed by a combination of Next Generation gene sequencing and phenotypic analysis for traits that are important for dealing with climate change and the need to reduce chemical inputs in agriculture, namely drought tolerance and growth under reduced nitrogen fertilizer. The peri-centromeric heterochromatin (PCH) of barley contains roughly a quarter of the genes for the species, in a genomic environment that has been reported to be antagonistic to both the expression and evolution of genes. We are looking at the diversity, expression and evolution of genes and the epigenome in the PCH of barley and comparing their properties to their counterparts in the euchromatin (Figure 3) (9). We use a combination of genomics approaches including RNA-seq (14), exome sequencing (5), ChIP-seq (10) and bioinformatics analysis (11). Figure 3: The PCH of barley restricts genetic diversity, recombination, gene evolution but not gene expression (Reference 9). A) Genetic versus physical map locations of genes on barley chromosome 2H. The centromere (dark grey oval) is surrounded by a continuous LR-PCH region (mid-grey bar), with flanking LR regions shown in light grey. B) Diversity and recombination statistics for chromosome 2H. Rolling averages for gene nucleotide diversity (π, red) are plotted with recombination rate (cM/gene, green) against gene order. The LR-PCH regions (grey shading) correspond to the regions in (A). C) Gene selection is less effective in the LR-PC region than the HR genome compartment of wild barley. πa/πs values per gene among 14 diverse barley lines (Y axis) are plotted against their corresponding linear gene orders (X axes) on barley chromosome 2H. Black lines indicate rolling averages (50 genes) and the LR-PC regions are shaded grey as before. D) Average RNA levels (arbitrary units), taken across 15 tissue types and developmental stages (Druka et al., 2006).for barley genes (Y axis) are plotted against their linear order (X axis) on barley chromosome 1H. The LR-PCH is again shaded grey. Every genome is modified and elaborated by chemical modification of both the DNA bases and the histone proteins which wrap up DNA. These epigenetic events serve many vital functions in major cellular processes including DNA replication, cell division, genetic recombination and gene expression. We have characterized the barley epigenome (10), by mapping nine modified histones in the barley seedling epigenome by chromatin immunoprecipitation plus next-generation sequencing (ChIP-seq). 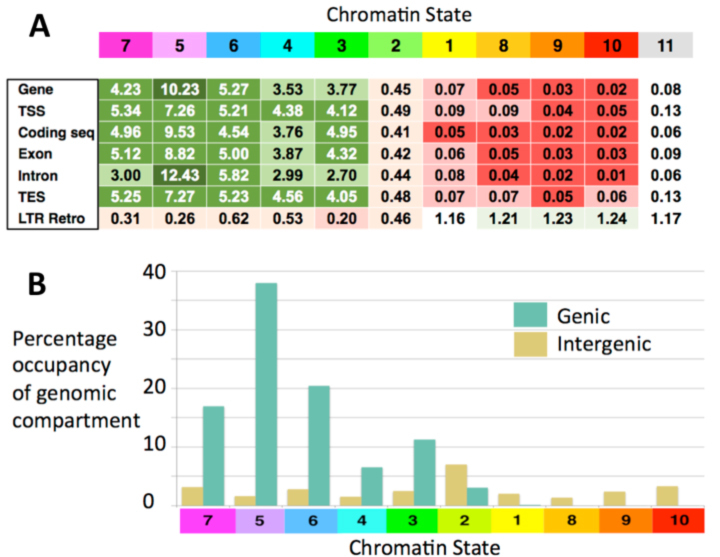 Particular modifications combine with others to define 10 chromatin states representing common local epigenetic environments in the barley genome. Five of these states map mainly to genes and five to intergenic regions. Some states label genes that are turned on in most tissues at most times, whereas others associate with genes that are switched off in some tissues or developmental stages. Enrichments of chromatin states in gene features and long terminal repeat (LTR) retrotransposons. Fold enrichments for barley chromatin states in annotated genomic features are indicated. Cell values are color-coded from dark green (highly enriched) through white (no enrichment) to dark red (strong negative enrichment). TSS, transcription start site; CDS, protein-coding sequence; TES, transcription end site; LTR Retro, LTR retrotransposon. Genic and inter-genic occupancies of chromatin states. Total percentage occupancies for each state in total genic (green) and intergenic (khaki) spaces are shown. The 10 chromatin states display striking distribution patterns that divide barley chromosomes into three distinct global environments (Figure 5). coded as shown in Figure 4. First, telomere-proximal regions (green in the figure) contain high densities of H3K27me3 covering both genes and intergenic DNA. Flanking these are gene-rich interior regions (purple in the figure) that are rich in active chromatin states and have greatly decreased levels of H3K27me3 and increasing amounts of H3K27me1 and H3K9me2. Lastly, H3K27me3-depleted pericentromeric regions (orange in the figure) contain gene islands with active chromatin states separated by extensive retrotransposon-rich regions that are associated with abundant H3K27me1 and H3K9me2 modifications. We propose an epigenomic framework for barley whereby intergenic H3K27me3 specifies facultative heterochromatin in the telomere-proximal regions and H3K27me1 is diagnostic for constitutive heterochromatin elsewhere in the barley genome. Hübner S, Günther T, Flavell AJ, Fridman E, Graner A, Korol A and Schmid KJ (2012) Islands and Streams: Clusters and Gene Flow in Wild Barley Populations From the Levant. Molecular Ecology 21: 1115-1129. Tondelli A, Xu X, Moragues M, Shnaithmann F, Sharma R, Ingvardsen C, Comadran J, Thomas W, Russell J, Waugh R, Schulman A, Pillen K, Rasmussen S, Kilian B, Cattivelli L and Flavell AJ (2013) Structural and temporal variation in the genetic diversity of a European collection of barley cultivars and utility for association mapping of quantitative traits. The Plant Genome 6:doi: 10.3835/plantgenome2013.03.0007. Mascher M, Richmond TA, Gerhardt DJ, Himmelbach A, Clissold L, Sampath D, Ayling S, Steuernagel B, Pfeifer M, D’Ascenzo MD, Akhunov ED, Hedley PE, Gonzales AM, Morrell PL, Kilian B, Blattner FR, Scholz U, Mayer KFX, Flavell AJ, Muehlbauer GJ, Waugh R, Jeddeloh JA, Stein N (2013) Barley whole exome capture: a tool for genomic research in the genus Hordeum and beyond. The Plant Journal doi: 10.1111/tpj.12294. Tondelli A, Pagani D, Ghafoori IN, Ataei MRR, Rizza F, Flavell AJ, Cattivelli L (2014) Allelic variation at Fr-H1/Vrn-H1 and Fr-H2 loci is the main determinant of frost tolerance in spring barley. Environmental and Experimental Botany doi: 10.1016/j.envexpbot.2014.02.014. Konecna E, Safarova D, Navratil M, Hanacek P, Coyne C, Flavell A, Vishnyakova M, Ambrose M, Redden R, Smýkal P. (2014) Geographical gradient of the eIF4E alleles conferring resistance to potyviruses in pea (Pisum) Germplasm. PLoS One 9:e90394. Sato K, Flavell AJ, Russell J Borner A and Valkoun J (2014) Genetic diversity and germplasm management – wild Barley, landraces, breeding materials. in (Kumlehn J and Stein N Eds) 'Biotechnological Approaches to Barley Improvement' Springer-Verlag, Berlin Heidelberg DOI 10.1007/978-3-662-44406-1_2, pp21-36. Baker K, Bayer M, Cook N, Dreißig S, Dhillon T, Russell J, Hedley PE, Morris J, Ramsay L, Colas I, Waugh R, Steffenson B, Milne I, Stephen G, Marshall D and Flavell AJ (2014) The low recombining pericentromeric region of barley restricts gene diversity and evolution but not gene expression. Plant J. 79, 981-992. Ouiji A, El-Bo S, Syed NH, Flavell AJ, Rouaissi M, Ben Younes M, El Gazzah M and Kharrat M (2016) A comparative study between molecular and agro-morphological methods for describing genetic relationships in Tunisian faba bean populations. J. New Sci. Agric. & Biotech. 27:1513-1518. Colas I, Baker K and Flavell AJ (2016) Immunolocalization of Covalently Modified Histone Marks on Barley Mitotic Chromosomes. Bio-Protocol 6: e1841. http://www.bio-protocol.org/e1841.